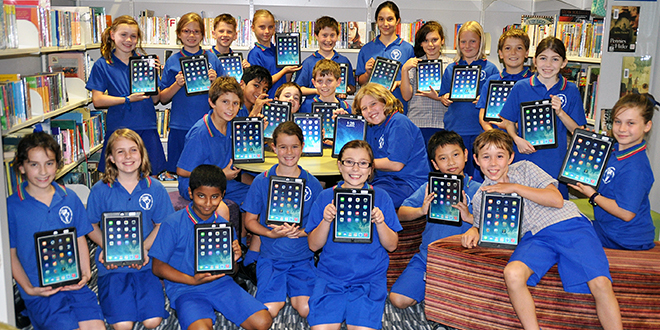 Technology boost: Year 5 students with their iPads at Our Lady of Dolours School, Mitchelton. SMILES of excitement spread across the faces of Year 5 students on their first day back at Our Lady of Dolours School, Mitchelton. Waiting for each student as they entered the classroom was a brand new iPad Air, being distributed as part of the school’s one-to-one technology trial. Principal Patrick Davis said the trial formed part of the school’s bigger-picture view that ensured the school was able to effectively manage resourcing and the provision for the delivery of information, communications and technology, including learning management systems, within the school to enhance student and staff engagement with learning, teaching and general school operations. “We recognised that through the introduction of iPads for each student, it might be possible to see a shift in how learning occurs and where it occurs,” he said. Mr Davis said technology formed a vital part of a high-quality, fully-rounded education in the 21st century. He said young people were using technology to assist them in life and learning, and the school believed students must be able to access digital information, tools and resources from anywhere, any time and in ways that led to a deeper engagement and understanding. “2014 will see the Year 5 students participating in the trial and, all going well, Years 4 to 6 students will participate in 2015 with the possibility of Prep to Year 3 students engaging in the program in 2016 and beyond,” Mr Davis said.